Training to be a LEGO Ninjago ! "Who wants to be a Ninjago?" Normally Daddy would have to coax us to attend events. This time round, when we learn that there is a 'training session' for Ninjago, it was not difficult to convince us to attend the event. 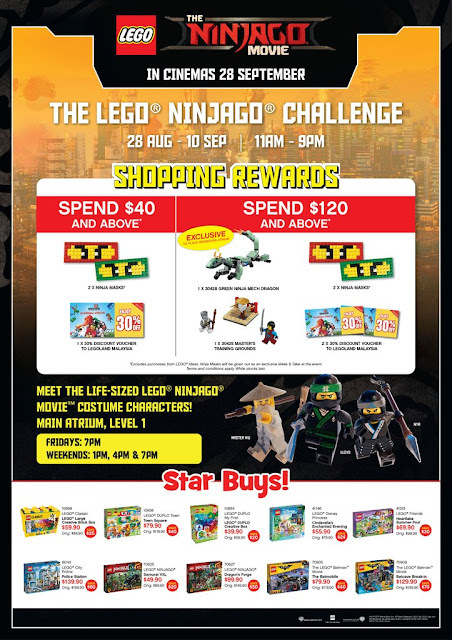 The Lego Ninjago Challenge is held at Plaza Singapura Atrium. The event is held daily from now till 10 September. With the premiere of The Lego Ninjago Movie on 28 September, this is a prelude for kids to experience life as a Ninjago. This is an event exclusive to Plaza Singapura . Kids can pit themselves against Lord Garmadon at three different battlegrounds , the Dojo, Jitsu and Mech area. Participation is free, but it is limited per day. Complete to see who will be the first to complete the mask puzzle. All the latest Ninjago sets are now display too... we had our eyes on the awesome Ningago city set. If we have the funds, we do not mind getting the whole movie sets too. There are other sets on sale too. Do look out for special offers by Bricksworld. Spend a certain amount and get free LEGO merchandise. For more details on The LEGO Ninjago Movie Challenge, do refer here. Disclaimer : TWD was invited for a media preview . All opinions are of our own.